A seriously important and highly credible study was published five months ago last October. It was completely ignored by all of the mainstream media. Not one took the opportunity to publish the stunning revelations for fear of what might happen if they did. 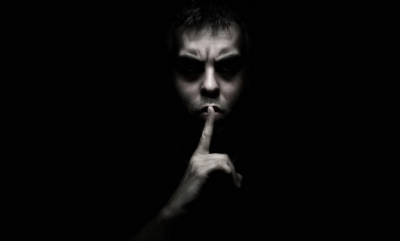 The report has unpalatable political consequences for the government – in fact, both Labour and Tory are implicated by the exposure of this colossal crime. To put that statement in context we need to deconstruct it a little. We are talking £4.5 trillion over two decades. That’s £225 billion a year. Each year, the banking and financial services industry in the City of London is sucking out of Britain’s economy the equivalent of 160 per cent of total government spending on all health care including the NHS, or 100 per cent on social protection, which includes that of all pension payments per year, or 700 per cent spent on public order and safety or 230 per cent of spending on education. To go further, this sum of money represents the equivalent of £67,500 of wealth losses to every person in the country. News reports galore tell us that the financial crisis cost Britains economy about £500 billion. Some say more, some less. Not one, anywhere, has stated that in the first decade it cost the economy £1.8 trillion. And it’s not over yet. Interestingly, Britain’s national debt is almost exactly £1.8 trillion. That’s about 86 per cent of total GDP and just servicing that debt in interest payments now amounts to around £48billion, which is roughly 4% of GDP or 8% of UK government tax income. 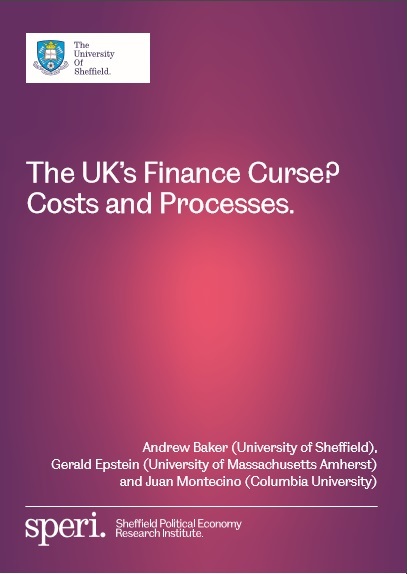 The evidence in this report also provides support for the idea that the UK suffers from a form of ‘finance curse’ – a development of financial over-dependence involving a crowding out of other sectors, such as manufacturing, and a skewing of social relations, geography and politics. In reality, the banking sector has been allowed by a lack of government restraint to act as a source of wealth generation, in other words, extraction, for the peole who keep them in power. The Tory party are by far the most guilty albeit that Tony Blair’s government did nothing to abate what should really be called out for what it is – crimes against that nation-state. This is theft, it is fraud. Evidence of the weakness of government is no more apparent than in the current PM Theresa May. The government’s decision to pull its financial services bill is at best revealing about who calls the shots in parliament. At worst, it indicates corruption at the highest level. And there is no doubting who is calling the shots. The people who largely fund the Tories in the first place – The City of London. A Guardian article published just yesterday tells us all we need to know about pulling of this financial services bill in its first paragraph. Here, we have evidence that even Brexit is being manipulated for the sake of the City of London. We have written endlessly at TruePublica on the matter of Britain’s laundromat – the money laundering centre of the world. The editor here, various journalists and contributors along with Global Justice to the Tax Justice Network have been screaming for financial regulation because the banking industry is seriously damaging Britain, its prospects and place in the world. The head of the National Crime Agency warns year after year of the economic and political threats that industrial-scale financial crime presents to Britain. And yet, over the last 40 years or so, Britain’s economy and its failing tax system have been completely reconfigured to serve the interests of the rich who have off-shored their wealth to ring-fence it away from contributing to the country of its extraction. No-one though, it seems, is prepared to fully challenge the sheer power of the City of London. The non-publication of the SPERI report by the mainstream media, that lays bare the realities of this monumental crime is surely evidence of that. Transparency International is just one of a long list of organisations that continues to provide cover. Its annual Corruption Perceptions Index calculates Britain has a score of 80 out of 100 and therefore one of the least corrupt countries in the world. In fact, the 11th least corrupt. I have challenged this ranking time and time again as Britain is one of the leading money launderers for terror finance, human and other trafficking, drugs, weapons and all manner of heinous crimes anywhere on the planet. I even met TI in London but all they were interested in was uncovering my sources of information. The square mile makes up its own rules, its own laws and even has its own police force. It is, as we wrote back in 2016 the epicentre of the global crime scene. Many do not know the power of the City of London. Most people do not know just how Britain’s democratic principles are challenged when it comes to its global financial operations. A (City of London) ‘watchman’ sits at the high table of parliament and is its official lobbyist sitting in the seat of power right next to the Speaker of the House who is “charged with maintaining and enhancing the City’s status and ensuring that its established rights are safeguarded.” The job is to maintain order and seek out political dissent that might arise against the City. The Square Mile is a hub that facilitates London bankers, accountants and lawyers to create a tax-free way for the richest people on the planet to hide their assets under UK management but without proper regulatory oversight. Britain has consistently resisted almost all reform proposals from the EU and used its powers of veto to ensure the status quo continues. Britain’s crown dependencies and territories are now the go-to bankers where almost a third of all global offshore financial services are provided to non-residents. In 2012 it was known that about $32 trillion was stuffed away in off-shore centres around the world. Global GDP in 2018 was just over $80 trillion – it gives some sort of perspective into the scale of it all. This report and one by the Tax Justice Network also calculates that financial crime and the costs imposed by hosting an oversized financial sector are more than two times greater for the UK than the US. It is of no wonder America wants to do a trade deal with Britain – it would provide additional facilities for its own financial crimes. A Bank of England report makes it quite clear what the banking industry is doing with its money. Only 3.5 per cent of all business lending by UK banks in 2017 went to Britain’s manufacturing sector, while 60 per cent of all lending went to financial intermediation, ie financial intermediaries who channel funds between lenders and borrowers. And as many have said, ourselves included, if Brexit was a cry for help from those being left behind, then nothing will change. It was supposed to end the political and financial class’s power and malfeasance. There is now a strong suspicion that Brexit, far from answering that call, will indeed be boosted by the forthcoming relaxation of regulations. Brexit will only make it worse for everyone – except the very, very few who actually hold the strings of power in the first place, which clearly isn’t Theresa May or her paralysed and incompetent government.